In this post: My fifth Pixar Camp post. 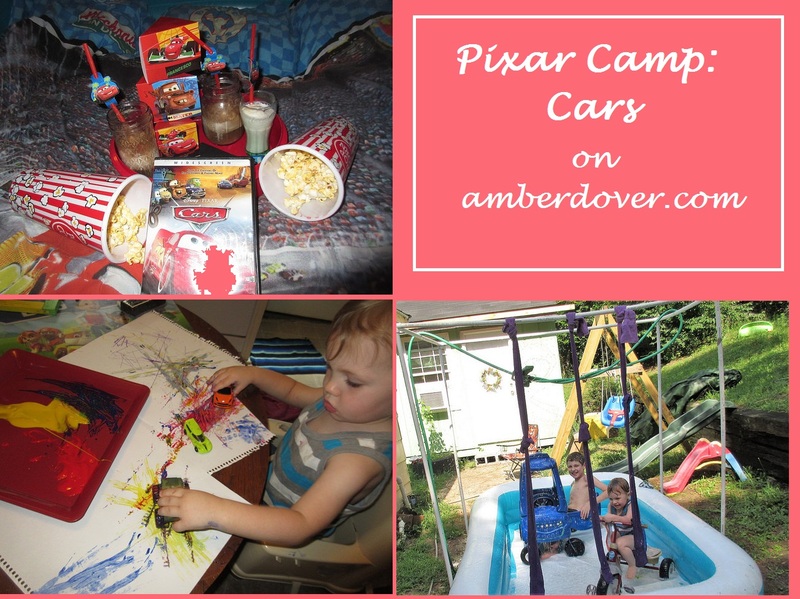 Cars themed fun! Hello, dear ones! We started school yesterday so as you can imagine I am hurrying to finish these Summer posts. We really had a busy Summer. Pixar Camp was a lot of fun and much cheaper than going to a normal camp. Cars was Michael’s favorite movie when he was Leeland’s age. In fact, we decorated his entire room in Cars decor. Now Leeland has that room. Many of these Pixar films came out when Michael was little and it’s so nice enjoying them with Leeland too. I nearly cried at this last Cars movie. Ha! A homemade pretend car wash– So my hubby made us a PVC pipe tent awhile ago. I rigged our water hose and sprinkler up at the top, tore a towel into strips, and hung them up over our pool. I gave the boys dish soap, sponges, and toy cars. Leeland’s “rocket” car and trikes nearly got as wet as he did! Painting and drawing with cars– We had a time trying to draw with the cars, but painting, on the other hand, worked nicely. Michael had a race on the chalkboard. A picture of the Summer car wash made a sweet memory on Leeland’s painting. They each had one. Homemade Drive In- Popcorn, root beer floats, and a movie under the stars! Our pool was useful for many things. We filled it with blankets and watched the first Cars movie…until it began to rain. Then we had to enjoy our treats inside. Seeing Cars 3 in the theater– Leeland and I had a date by ourselves. He got a Cars outfit, Lightning McQueen toy, and a haircut first. Bumper Cars- Michael and I also had some alone time and we had fun with the bumper cars. Car fun with the water table! Fake mud! An idea I really wanted to try but we didn’t have time: a play car engine.